As a career counsellor and corporate trainer, Farzad came across many students and professionals who ask him how to get into an entrepreneurial role. 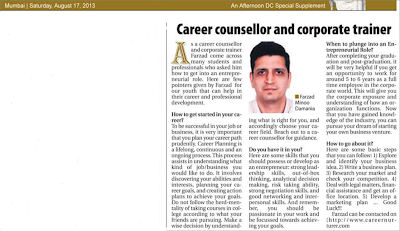 Here are few pointers given by Farzad for our youth that can help in their career and professional development. How to get started in your career? To be successful in your job or business, it is very important that you plan your career path prudently. Career Planning is a lifelong, continuous and an ongoing process. This process assists in understanding what kind of job/business you would like to do. It involves discovering your abilities and interests, planning your career goals, and creating action plans to achieve your goals. Do not follow the herd-mentality of taking courses in college according to what your friends are pursuing. Make a wise decision by understanding what is right for you, and accordingly choose your career field. 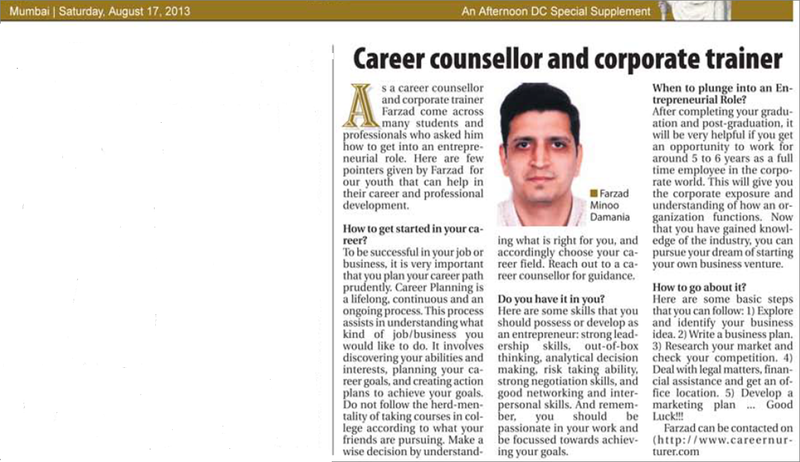 Reach out to a career counsellor for guidance. Here are some skills that you should possess or develop as an entrepreneur: strong leadership skills, out-of-box thinking, analytical decision making, risk taking ability, strong negotiation skills, and good networking and interpersonal skills. And remember, you should be passionate in your work and be focussed towards achieving your goals. When to plunge into an Entrepreneurial Role? After completing your graduation and post-graduation, it will be very helpful if you get an opportunity to work for around 5 to 6 years as a full time employee in the corporate world. This will give you the corporate exposure and understanding of how an organization functions. Now that you have gained knowledge of the industry, you can pursue your dream of starting your own business venture. Here are some basic steps that you can follow: 1) Explore and identify your business idea. 2) Write a business plan. 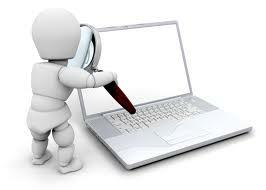 3) Research your market and check your competition. 4) Deal with legal matters, financial assistance and get an office location. 5) Develop a marketing plan … Good Luck!!! 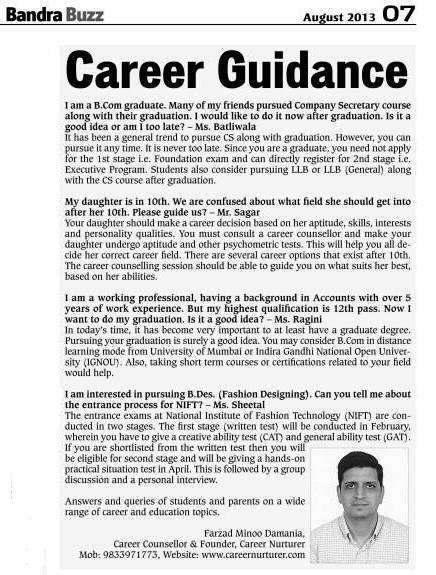 Career Nurturer answers career queries of students/parents in Bandra Buzz Newspaper – August 2013 issue, on Career Guidance Q&A. It has been a general trend to pursue CS along with graduation. However, you can pursue it any time. It is never too late. Since you are graduate, you need not apply for the 1st stage i.e. Foundation exam and can directly register for 2nd stage i.e. Executive Program. Students also consider pursuing LLB or LLB (General) along with the CS course after graduation. Your daughter should make a career decision based on her aptitude, skills, interests and personality qualities. You must consult a career counsellor and make your daughter undergo aptitude and other psychometric tests. This will help you all decide her correct career field. There are several career options that exist after 10th. The career counselling session should be able to guide you on what suits her best based on her abilities. In today’s time, it has become very important to at least have a graduate degree. Pursuing your graduation is surely a good idea. You may consider B.Com in distance learning mode from University of Mumbai or Indira Gandhi National Open University (IGNOU). Also, taking short term courses or certifications related to your field would also help. The entrance exams at National Institute of Fashion Technology (NIFT) are conducted in two stages. The first stage (written test) will be conducted in February wherein you have to give a creative ability test (CAT) and general ability test (GAT). If you are shortlisted from the written test then you will be eligible for second stage and will be giving a hands-on practical situation test in April. This is followed by group discussion and personal interview. 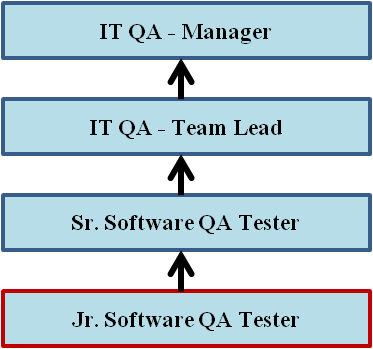 A Software Quality Assurance Tester is a person who works on designing of test plans, scripts and procedures for testing applications, software and website portals before it is deployed into live systems. 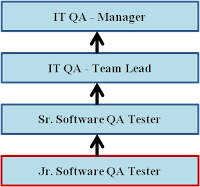 A Software QA Tester works closely with programmers, developers and analysts. Review software documentation to ensure technical accuracy, compliance, risk analysis. Note: Certifications in the fields of Business Analysis, Software Programming, Project Management and Change Management are also pursued along with QA Testing Certs to improve IT knowledge. 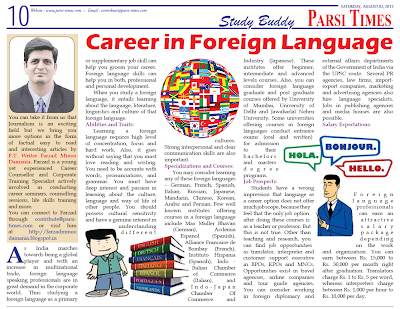 Check out my article publication in Parsi Times Newspaper dated 3rd August 2013, on Career in Foreign Language. As India marches towards being a global player and with an increase in multinational trade, foreign language speaking professionals are in great demand in the corporate world. 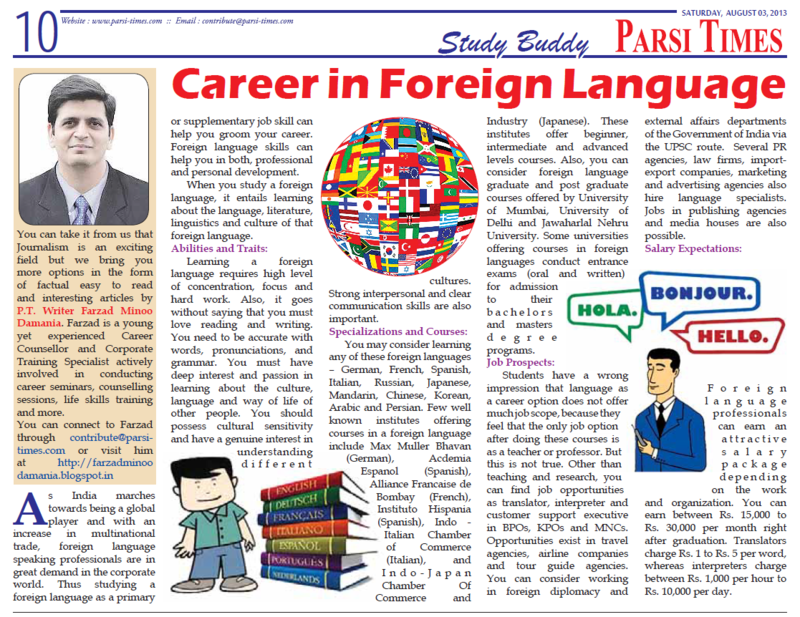 Thus studying a foreign language as a primary or supplementary job skill can help you groom your career. Foreign language skills can help you in both professional and personal development. When you study a foreign language, it entails learning about the language, literature, linguistics and culture of that foreign language. Learning a foreign language requires high level of concentration, focus and hard work. Also, it goes without saying that you must love reading and writing. You need to be accurate with words, pronunciations, and grammar. You must have deep interest and passion in learning about the culture, language and way of life of other people. You should possess cultural sensitivity and have a genuine interest in understanding different cultures. Strong interpersonal and clear communication skills are also important. You may consider learning any of these foreign languages – German, French, Spanish, Italian, Russian, Japanese, Mandarin, Chinese, Korean, Arabic and Persian. Few well known institutes offering courses in a foreign language include Max Muller Bhavan (German), Acdemia Espanol (Spanish), Alliance Francaise de Bombay (French), Instituto Hispania (Spanish), Indo - Italian Chamber of Commerce (Italian), and Indo-Japan Chamber Of Commerce and Industry (Japanese). These institutes offer beginner, intermediate and advanced levels courses. Also, you can consider foreign language graduate and post graduate courses offered by University of Mumbai, University of Delhi and Jawaharlal Nehru University. Some universities offering courses in foreign languages conduct entrance exams (oral and written) for admission to their bachelors and masters degree programs. Students have a wrong impression that language as a career option does not offer much job scope, because they feel that the only job option after doing these courses is as a teacher or professor. But this is not true. Other than teaching and research, you can find job opportunities as translator, interpreter and customer support executive in BPOs, KPOs and MNCs. Opportunities exist in travel agencies, airline companies and tour guide agencies. You can consider working in foreign diplomacy and external affairs departments of the Government of India via the UPSC route. Several PR agencies, law firms, import-export companies, marketing and advertising agencies also hire language specialists. Jobs in publishing agencies and media houses are also possible. Foreign language professionals can earn an attractive salary package depending on the work and organization. You can earn between Rs. 15,000 to Rs. 30,000 per month right after graduation. Translators charge Rs. 1 to Rs. 5 per word, whereas interpreters charge between Rs. 1,000 per hour to Rs. 10,000 per day. 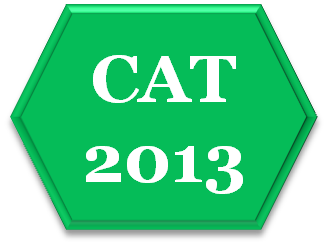 The Common Admission Test (CAT) 2013 for admission to IIMs and other B-schools will be conducted from 16th October 2013 to 11th November 2013.